Cooking fascinates me; to my mind it is one of the truly magical practices available to us mortals. A pinch a this and a dollop of that combine to make something that can nourish the body and delight the soul….. amazing! One of my great joys is reading cookbooks, and I’ve recently rediscovered an old favourite, May All Be Fed: Diet for a New World, filled with familiar recipes for quirky vegan comfort foods… I’m such a California girl at heart! My update of Ginger Tea has been keeping the sniffles and snuffles at bay throughout this long, cold winter, and we’re going to keep drinking it through the next few weeks as we finally transition into our long-awaited springtime. 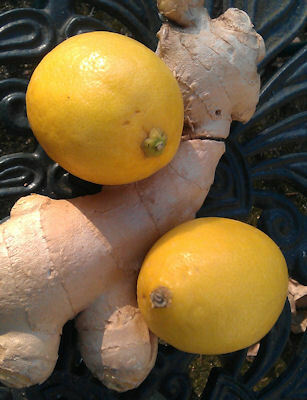 Bring the water and ginger to a boil, then reduce heat and simmer for 10 minutes. Strain out the ginger pieces with a slotted spoon. Add honey or stevia to taste and serve hot or cold. This concoction will boost your immune system as it warms the body and comforts the soul; what a wonderful way to see out winter’s last icy blast!